I LOVE making food that is healthy...but you'd NEVER know it! This dish is SO full of flavor and deliciousness, you'd never know it was a "skinny" dish. And even better? It's made in the slow cooker so you don't have to do a lot of work! My kind of meal. Our house smelled AMAZING while this was cooking. We almost didn't want to wait the full 6 hours to let this cook. The weather in LA has been pretty cold (yes, 30s IS cold for LA. If you want to laugh at us, check this out ) and this dish was perfect for a cold, winter night. Filled with veggies & chicken, I did have to add just a pinch (or 2) of low-fat cheese & a tiny serving of light sour cream because it wouldn't be chili otherwise. I served the chili atop a piece of corn bread casserole. That recipe comes tomorrow. Big thank you to Gina at skinnytaste for the recipe! 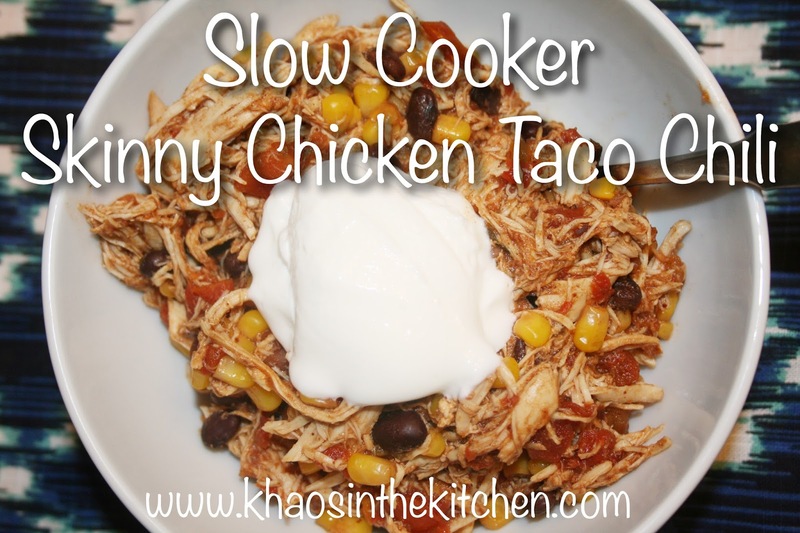 Combine everything (minus cheese & sour cream of course) in crock pot, placing chicken on top. Cover and cook on high for 5 1/2 hours. LOVED this one! Super tasty. Even passed it on to some coworkers who have also enjoyed. Highly recommend!